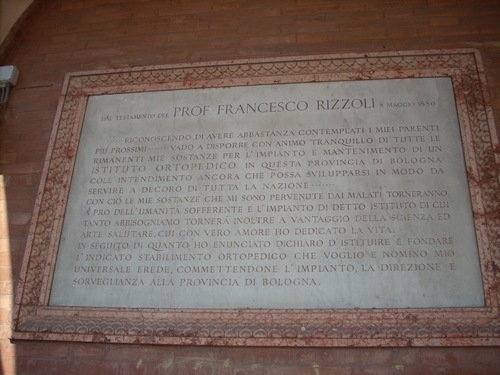 Near the entrance to the old building of the Istituto Ortopedico Rizzoli, in Bologna, two memorial tablets can be seen. 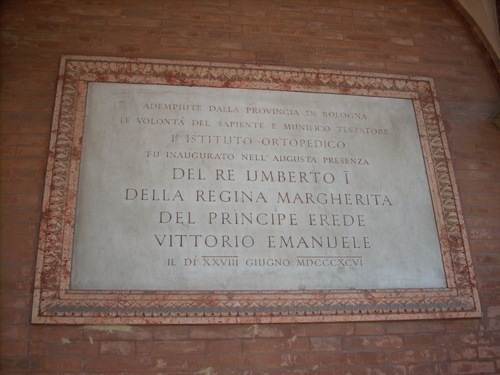 On the left, the one quoting part of the will of Francesco Rizzoli leaving his fortune for the foundation of the Institute; on the right the one remembering the Inauguration of the Institute, taking place on June 28, 1896, at "the presence of King Umberto I who, ater just eight years, once again rode up to San Michele in Bosco, thus attesting to the exceptional importance of the new scientific work (…). The sovereign was accompanied by Queen Margherita, Prince Vittorio Emanuele and the Marquis Antonio di Rudini, President of the Council of Ministers"1. 1. A.Cioni, A.M.Bertoli Barsotti (eds. ), The Rizzoli Orthopedic Institute in San Michele in Bosco. The Artistic Heritage of the Monastery and the Historical Events of One Hundred Years of Orthopedic Surgery, I.O.R., Bologna 1996, pp. 50-52.